Autumn and spring are my absolute favourite seasons. The colour that transforms our streets and parks and woodland never fails to uplift and inspire me as nature puts on her spectacular end of year finale. I struggle with winter - the dark days, bleakness and brown everything - so I like to savour and soak up autumn whilst it's here. My favourite way to do that is of course photography (I'm typing this on a crisp winter's day and re-living all those beautiful moments and that delicious colour as I look through my photos). So I thought it would be fun to share some of my favourite autumnal leafy photographic pursuits and a lovely burst of colour along the way. 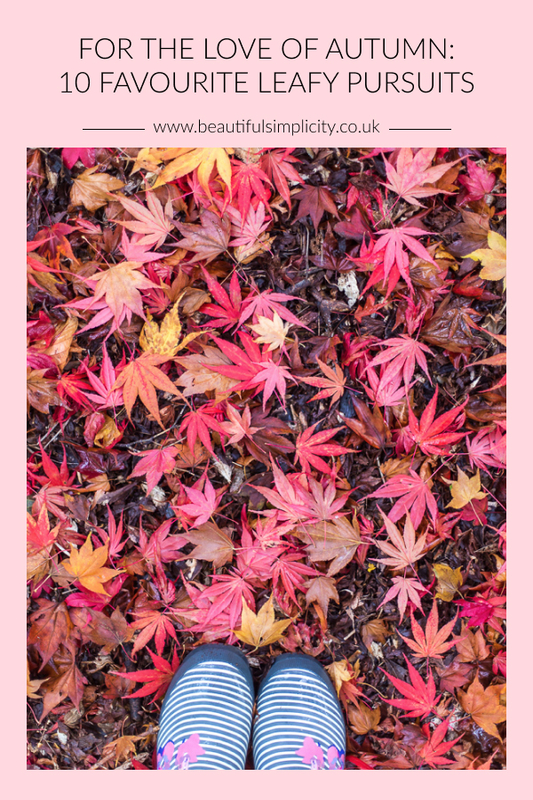 All of these photographs were taken at Winkworth Arboretum, Sheffield Park & Gardens and Scotney Castle (all National Trust) - my favourite places for autumn colour near me. Those amazing leaves deserve their moment in the spotlight. I love to hunt out the extra special ones and find a lovely colourful backdrop (a pile of leaves on the floor or a colourful tree is ideal) and use a shallow depth of field to blur the background and allow the leaves to stand out. For most of these shots I used a 50mm f1.4 lens on my Canon 6d and shot wide open at f1.4 for maximum blur and also because the light was very low. My usual lens of choice for autumn shots is my 100mm f2.8 macro lens which allows me to reach up into the trees, but for these shots, as I was holding the leaves whilst photographing them, I needed a shorter focal length. As well as honing in on the details of autumn, I love to stand back and look at the sum of its parts. 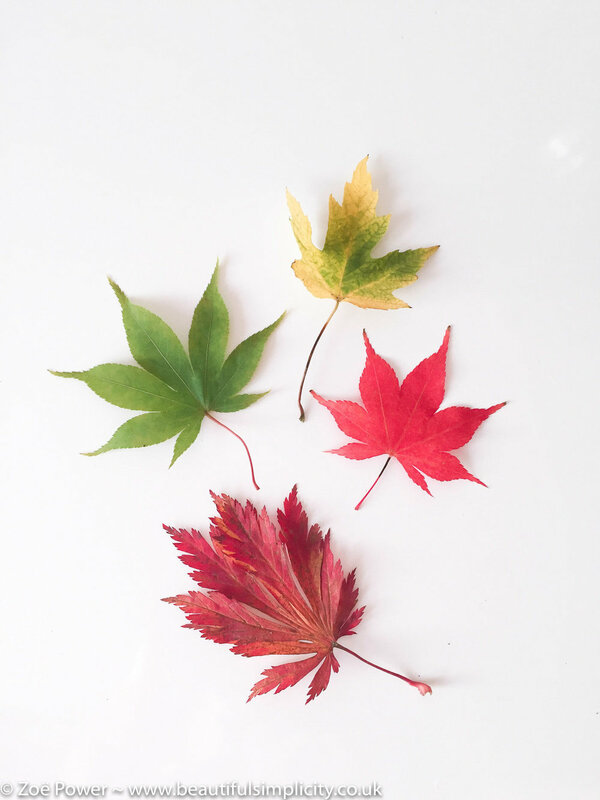 The beautiful tonal ranges and melee of different colours from leaves at different stages of transformation, all working together to please our eyes. Sometimes these beautiful colour combinations can be found in a single tree, other times beautiful compositions can be created by placing a contrasting colour in the background of the tree or leaf you are photographing (as I did with the close-ups above). 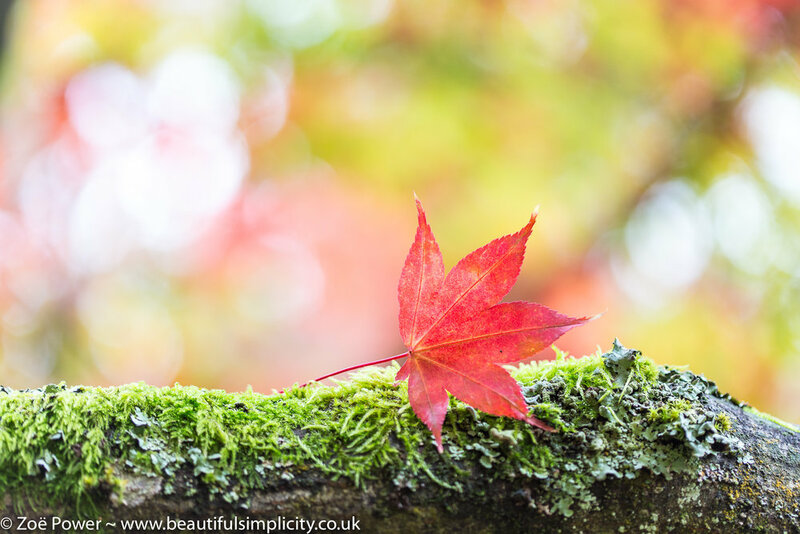 I always love to use a shallow depth of field for my autumn shots, to blur the background and allow the eye to focus on the important leaves or tree in the foreground; this also helps to accentuate any colours in the background, as they simply become colour rather than distracting details. 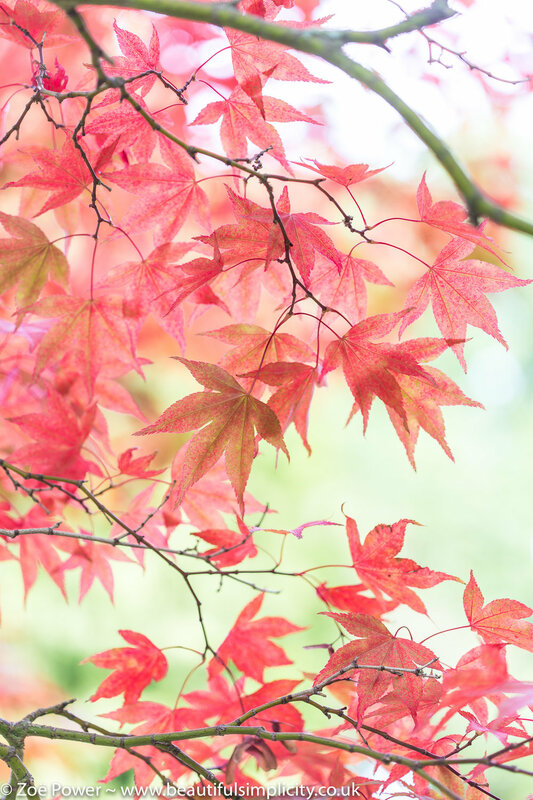 TOP TIP: leaves will keep well for a few days in the fridge if you put them in a plastic bag with a sprinkle of water. This comes in handy if you want to photograph them, but the light has gone by the time you get back home. This goes hand in hand with no.3 above. 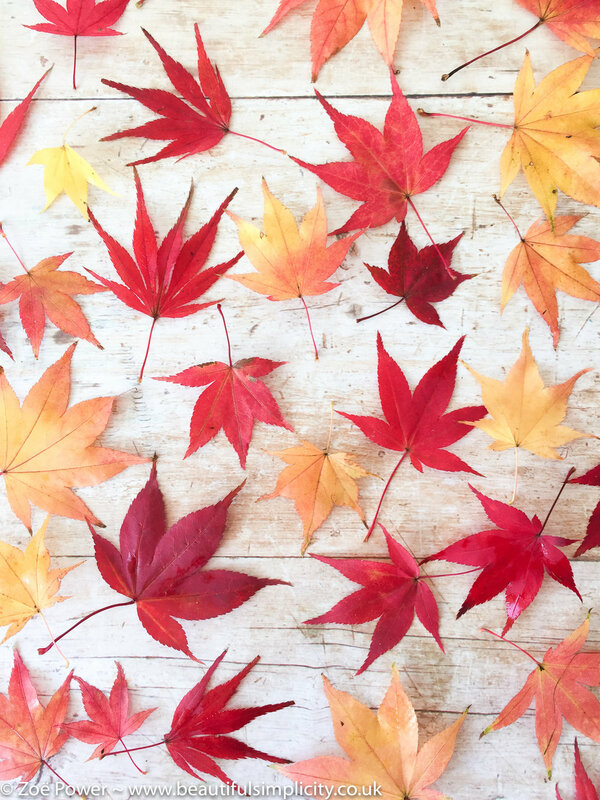 For me, one of life's great pleasures is arranging leaves in pleasing combinations and shapes and then photographing them to enjoy for months and years to come. It's a wonderful activity for mindfulness practice as it is wholly absorbing - I find it so relaxing. There is so much joy to be found in autumn whichever way you look. But a carpet of fallen colourful leaves is so very beautiful and brings out the inner child in me. After photographing their perfection, I can't help but kick them along or throw great handfuls of them up in the air (I'll spare you the slow-mo videos of me doing this ;) Whatever you do, make sure you look down to your feet as well as up in the air or there is so much you will miss. Sometimes (often!) the best views and light are from under the trees. You'll often find me pacing around and doing circuits of my favourite trees to find the best light - and looking up. So many people seem to just stroll on by, missing out on some of the best colour and photo opportunities. Go under and look up people! Autumn colours can be rich and vibrant, but I've found my taste veering towards the softer end of the spectrum with some gentler, more muted colours of late. I love to seek out the pastel tones and accentuate the softness with a very shallow depth of field (you will likely gather I'm a big fan of blurry backgrounds!). A big part of the fun is then back at my computer, reviewing the beauty I've captured and playing with the edits to soften the colours and cool the tones to fit with my style. Happy New Year lovely people! Before I get stuck into all the plans for 2017, I like to pause for a while to savour all those special moments from last year that made me happy and to celebrate all the things big and small that I'm proud of. And for me, there's no better way to do this than by looking back over my photographs. DISCLAIMER: This is most definitely a highlight reel! Not mentioned are the lows, the tears, the bad Chronic Fatigue days, the frustrations and the self-doubt. I choose to focus on the positives and look for all the things I have to be thankful for. For me, it's the only way. Inspired by the lovely Hannah Argyle, I've done something a little different this year. Rather than just collect together my favourite images from my "big" camera, I created a favourite grid of images from Instagram each month that capture a wider set of memories. The mosaic above is my collection for the year. I think it's fair to say I'm still in love with colour! A day of fleeting snow and lots and lots of painting walls white and deliberating over which white flooring to choose. Plus of course some walks by the sea and pretty sunsets over the rooftops. Signs of spring just starting to emerge and some big blue skies to help the February blues. My first attempts at brush lettering (makes me realise how far I've come! ), decorating our bedroom and trips outside in search of spring. Colour at last! Feasting on the happy colours of tulips and daffodils and savouring every minute of our week's holiday in Cornwall. Probably the happiest moment of 2016 that changed our lives forever - we adopted Misty :) Plus bluebell carpets, tulip festivals, crab apple blossom in our garden and some meditative shell faffing. A floral extravaganza in the garden - reaping the rewards of planting out an entire back garden and most of our front garden. The most Peonies I have ever seen on one bush and the most amazing Lupins and Delphiniums. All the flowers above are from our garden. A wonderful visit to West Dean Gardens in its prime, more flowers from the garden and some beautiful cliff path walks close to home. Still enjoying the beautiful flowers from West Dean Gardens, plus happy visits from friends, more flowers from the garden, golden fields and walks by a mirror like sea. Oh and some improved brush lettering! The loveliest staycation week exploring Littlehampton, Camber Sands and Cuckmere Haven in the sunshine with little Misty. And a big milestone for me - adding some brush lettered inspirational quote designs to my Etsy shop for the first time. A feast of autumn leaves after a lovely short break for my birthday visiting Winkworth Arboretum and Sheffield Park and Garden. Plus perfectly matching flowers from the garden for my gorgeous new bottle vase from the lovely Katie a.k.a Ceramic Magpie. Sharing more leaves and bright crisp walks by the sea, whilst I'm head down working on printable calendars and designs for my Etsy shop. Sharing more of my brush lettered designs on Instagram and the 3 printable calendars I created. Plus pretty skies, more beachy walks and the most beautiful paper peonies from A Petal Unfolds. And of course, the crazy pre-Christmas full-on rushing around and prep (not pictured!). If you fancy taking a look at the full size images from my DSLR, head over to my 2016 Favourites set on Flickr, or click through the embedded album below. So this just leaves me to wish you all a most wonderful 2017. I hope it is filled with many happy moments and kindness to yourself, doing more of the things that bring you joy. Happy New Year lovely people! I always like to start a shiny new year with a little reflection - looking back on the highs and lows, and looking forward by setting a focus and some intentions for the year ahead. One of the main ones this year is to live more in the moment, and to develop my meditation and mindfulness practice to help with that. But I don't think that means that you shouldn't reflect on what has been - I find I can learn a great deal that way, when it is done with kindness to myself. And it helps me realise how much I have to be thankful for, and how far I've come. I had the pleasure of discovering Merriments Garden, near Hawkhurst in Kent, and seeing it change colour through the seasons. There were plenty of walks on the beach in my beautiful new home town of Seaford. I was overjoyed to find row upon row of pretty colourful beach huts and soft sand and dunes at West Wittering. Then there were the beautiful tulips at Pashley Manor Gardens and the spectacular display of bluebells on the Arlington Bluebell Walk. There was more feasting on colour at Merriments Garden, fun hunting down the colourful beach huts at Littlehampton and East Preston, a day of marvelling at the beauty and variety of the flowers at West Dean Gardens, and lots of time to enjoy the sunshine at home in Seaford. I absolutely adore autumn. This year I had the pleasure of discovering some new haunts, including Sheffield Park & Gardens. But I had to return to my all time favourite, Westonbirt Arboretum, for a birthday photography shoot - their collection of Acers cannot be beaten. And then to round things up, I have a collection of seascapes for you, as my first year living by the sea in East Sussex has meant lots of visits to the coast. I have thoroughly loved discovering so many new places and look forward to lots more of that next year. I am so deeply grateful that after years and years of discussion we were able to make our dream of living by the sea a reality. I love it here so much! The first row shows Camber Sands, a beautiful big stretch of sandy beach with dunes behind and so much S P A C E. Then we have the breathtaking Birling Gap, with its tall, sheer white chalky cliffs and giant rocks - I just adore this place - somewhere to really feel the power of nature and put your troubles in perspective. Row three are some favourites of Westward Ho! on a gorgeous summer evening - I love the space here and the beautiful pebbles. And finally we have a collection of shots showing Seaford Head and Cuckmere Haven (some of you may recognise this from the recent Luther episode) - the scenery that tempted us to move to Seaford. If you'd like to see the full images, do have a browse through my 2015 Faves album on Flickr and you might also like to follow along on Instagram too. 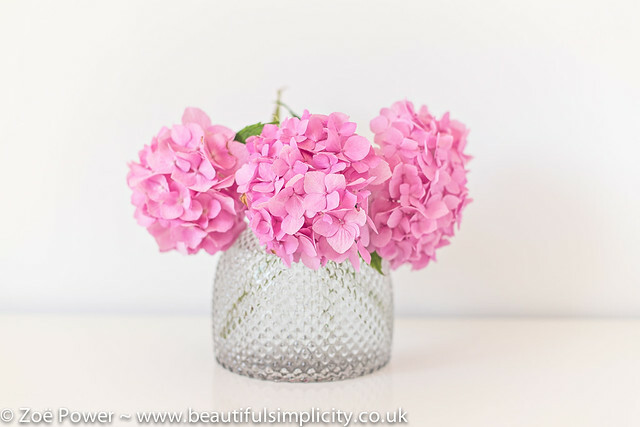 First up, are some of my floral favourites. I've been a regular visitor to the beautiful Oxford University Botanic Garden over the seasons, and this year I got to visit the very beautiful Cambridge University Botanic Garden as well. Next we have some seaside favourites - always so hard to choose! 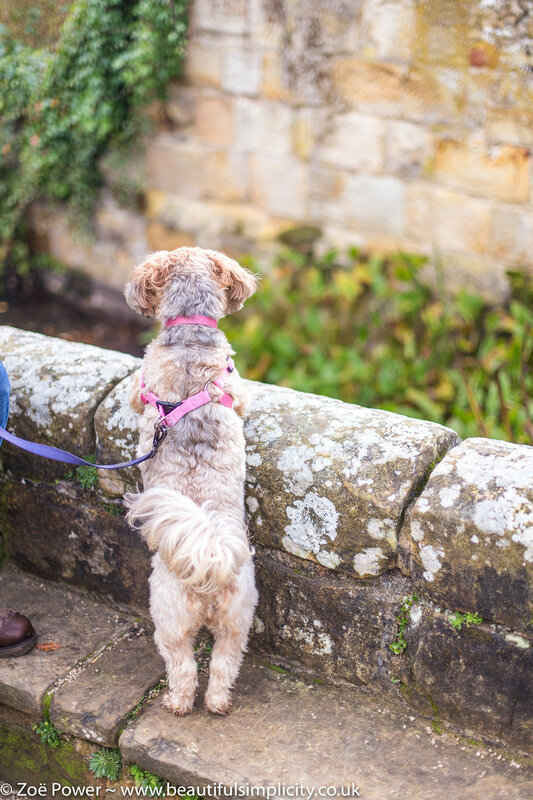 We had the pleasure of visiting the beautiful Christchurch on a sunny spring day, a delicious week in Watergate Bay in Cornwall in late spring and a fabulous summer week exploring South and East Devon and a little bit of Dorset. Then I've put together a few favourite snaps of my home and vintage bits and bobs, as well as a few of my makes. I was delighted to have my home tour published in Mollie Makes back in January (you can read about it here and here), followed by the Back Page Project in the summer where I talked about getting my inspiration from the seaside. I'm excited to have a new home to style and decorate and make my own - so watch this space! Now the year wouldn't be complete without a good dose of autumn colour. 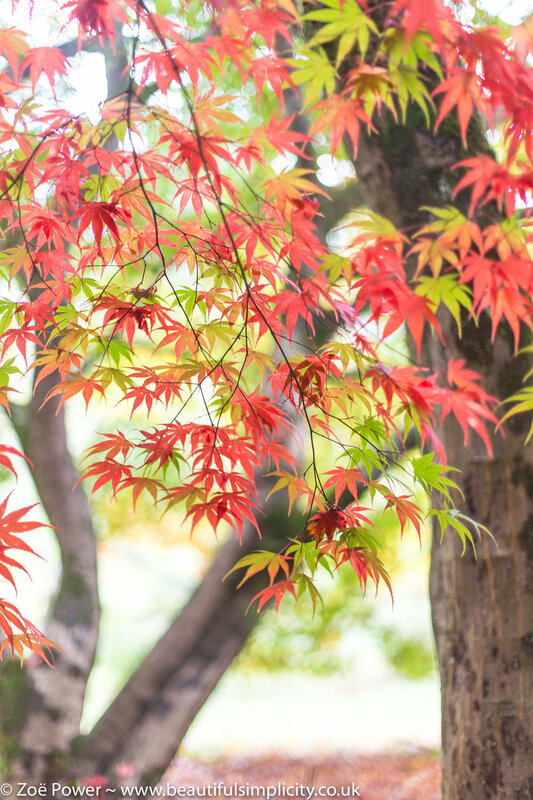 I just adore autumn leaves and was lucky enough to visit three arboretums this year: Batsford, Harcourt and Westonbirt. I'll have to find some new autumn haunts for next year! And last, but most certainly not least, I thought I'd share some favourites from my new neck of the woods: East Sussex. We have visited many times this year as we researched where we wanted to move to, including a lovely week near Alfriston. We fell in love with Seaford - the stretch of coast between Seaford and Eastbourne is breath taking. We are spoilt with beaches, dramatic cliffs, undulating green hills and beautiful forest (and of course, Brighton is only a short hop away). I'm looking forward to lots of walking and exploring in 2015, with my camera of course! Still pinching myself to make sure we really do live here and feeling immensely grateful. Apologies if you've seen nothing but "review of the year" type posts for the last few days. But it's something I'm very fond of. I love looking back over my photos of the year and remembering and reflecting and smiling. I only photograph the pretty stuff, so it's most definitely a highlight reel - don't think my life is all pretty pastel dreams! This year has certainly not been that. Next, it's my summer favourites. It was so very lovely to have a proper summer this year. I spent lots of time in the garden - bliss! And enjoyed the beautiful flowers and butterflies in the Oxford Botanic Garden and Waterperry Gardens, and finally made it the Columbia Road flower market - crazy yet beautiful! Thirdly, we have my favourite seaside shots of 2013. I adore the sea, as you can probably tell, and desperately need a regular sea fix. One day, we will move to the sea. For now, we visit as often as we can. The shots below are of Christchurch in Dorest (those beach huts! ), Jersey (a lovely trip home to see my family), Devon and Cornwall. Next it's my favourite pics of my home and my knick knacks/vintage kitsch stuff - or treasure as I like to think of it. Pretty things that make me very happy. Especially at the moment, I spend a lot of time at home, so it's very important to me for it to be a happy, colourful, pretty space. I've had so much fun thrifting this year and also making things after my wonderful sewing course. More of that to come in 2014! Then we have my favourite Blythe shots of 2013. My collection has massively slowed down this year. Only two new girls this year: Tarts and Tea (purchased from the lovely Candy Pop on the first day of the year!) and a factory girl that's currently in pieces. And my Casual Affair went to live with my sister. This year, I plucked up the courage to take some dolls apart and matte their faces and change their eye chips. It made a huge difference to my photography, and as soon as I have some strength I will tackle a few more! I was also extremely fortunate to attend my first ever Blythecon in New York. Then we have my favourite autumnal shots of the year. Autumn this year was spent in New York, Vermont and Maine - a stunning way to enjoy my favourite season for colour. And last, but definitely not least, a round-up of some of my favourite shots taken on my travels this year. We have a row each for the Lake District (a week in June and it didn't rain!!! ), New York, Vermont, and Maine. I turned 40 in October, so went on a fabulous USA trip to celebrate.